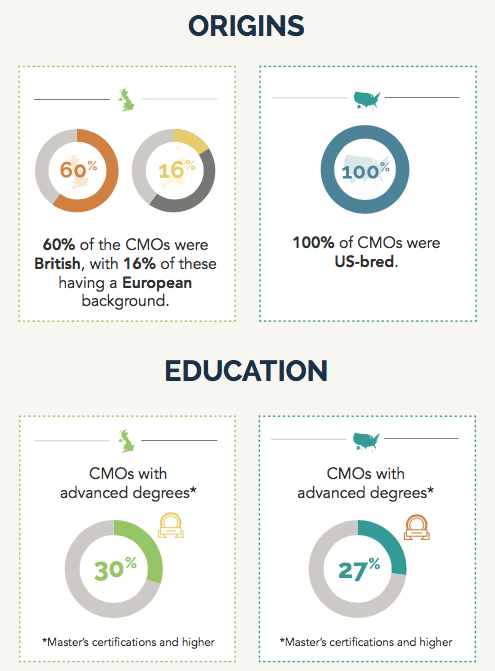 The majority of chief marketing officers (CMOs) in the US are women and all American CMOs were US-bred. But while the UK still sees men making up the majority of senior marketing roles, hiring is more diverse in terms of origin - only 60% of British CMOs were born here. And the UK also leads on advanced education which may give them the edge when it comes to staying competitive. The findings come from CMO Index, a survey carried out by adaptive marketing software vendor Act-On among 80 UK CMOs in FTSE 100 companes and 70 US-based CMOs in Inc. 5000 businesses. It discovered that 30% of the most senior marketers in the UK held a Master or higher certification, compared to 27% in the US. And there was little sign of establishment bias - just 9% went to Oxbridge. While ambitious British marketers may identify getting advanced skills as the way forward, they will also need to learn patience - it typically took them eight to nine years before being promoted to CMO, whereas it only took five years for their US peers. But promotion is largely from within in both countries (86% in the UK, 89% in the US).